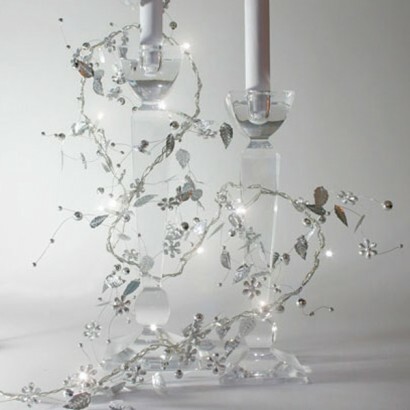 Embelished with Silver Pearls, leaves, and crystal flowers this beautiful set of bright white LED string lights is very very pretty. Totally portable as battery operated they can be used for all sorts of decorative ideas, such as Wedding or Christmas table centres or decorations or even for adding something a bit special and glitzy to an outfit. With an overall length of 2.7M and 1.7M of illumination. Bought a set of these to enhance a display on mantelpiece . Have had so many compliments from friends ! Will be buying more as gifts . Bought 2 sets of these to use in ornamental cages , they look great and so whimsical ,, Had lots of great comments. Will be ordering more as they will be great to brighten anything up so will be using them on Xmas things also .